Browse:Home Wilnoteka V. Benkunskas: We are fighting for good quality and better teaching conditions! For a year already the issues concerning education of the Vilnius City have been held in Deputy Mayor Valdas Benkunskas’s hands. 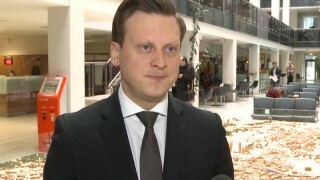 Coming from Šilutė, this ambitious, almost 32-year-old representative of the Conservatives-Christian Democrats has been a Vilnius man for twelve years, and for five – a councillor of our city. Does he embody the local version of the American Dream – “Lietuvio svajonė”? Or rather “sapnas”? In the memory of Poles living in Vilnius for sure he’ll be remembered as “the one who strengthened Polish schools out,” fulfilling dreams of several generations of his natives in the majesty of law. We’ve already undergone the first stage of this “reorganisation;” there are still the remaining to be carried out. After the Konarski School and Lazdynai cases, the ones of the Lelewel and Syrokomla Schools (the last two secondary schools in Vilnius!) haven’t been solved yet, but there are already some ideas for primary schools in Liepkalnis and Pavilnys (if I’m to limit myself to mentioning just the Polish schools). Will we regret one day that the education issues haven’t been included in Marek Adam Harold’s area of responsibility for example – the first British man in the Local Government of Vilnius? Perhaps; but the Lithuania’s capital city is changed by youth that haven’t even graduated from a Vilnius school – after all, it could be an obstruction when making decisions, especially the unpopular and controversial ones, which indeed are what’s really necessary in Vilnius – according to the Deputy Mayor – for the good of the very students and better learning conditions! Valdas Benkunskas gained his political savvy as an adviser to the Saudargas family (the MEP and former Chef of the Ministry of Foreign Affairs Algirdas and his son Paulius) and we can see that it was a good training, since it wasn’t any of his older party colleagues, like Vidas Urbonavičius, who’s become famed for his honesty when he didn’t accept a bribe (he comes from the Šiauliai environs), or Mykolas Majauskas, who was Andrius Kubilius’s protege and candidate of the Homeland Union for the Vilnius mayoralty (at least he was born in Vilnius, though he spent a considerable part of his life abroad), but Benkunsas indeed who stood on the right hand of the new mayor-liberal to help him make not always liberal decisions. The Deputy Mayor himself points out that the situation which his predecessors had left the Vilnius education in required immediate action. The nationality of a student, according to him, doesn’t mean much. The education reform lay fallow, some schools were overcrowded, some were filled with emptiness, so he got down to work. Schools with Polish as a language of instruction were at the crossroads – some part divided itself into “gimnazjums” and primary schools accordingly to the spirit of the reform, another part more and more frequently defended the position that such a division would just inflict harm to national minorities’ schools and that they should keep the 12-year learning cycle, which would allow to maintain the existing network of Polish schools; especially because an option of a so-called “long gimnazjum” has emerged (so together with the primary school, not 9-12, but 5-12 or 1-12). But it was the city authorities’ decision on the J. Lelewel Secondary School that turned out to be a slap in the face of the school and pride of the Vilnius Poles. The above mentioned institution is the oldest functioning Polish school in Vilnius, which was once somewhat disturbed by the combination with Russian classes, but you cannot destroy a legend! The new authorities proposed a “fair deal,” which was a move from Antakalnis to the other side of the Neris River, as they weren’t going to maintain the school branch (until recently – the Antoni Wiwulski Primary School) and its main seat while both were half empty. What’s more, a considerable part of the main building is already occupied by the Lithuanian Progimnazjum in Antakalnis, which has its rooms… in three different buildings and finds it too little already! Poles would agree with the statistical argument if they could, for example, come back from both sides of the Neris River to the historic building of the school located close by, which was built at the time of the Second Polish Republic (1930) and was the birthplace of the school’s legend in the 50s and 60s of the 20th century. Perhaps under the rule of the previous coalition it would have been possible to organise the Lelewel School in such a way that the Lithuanian Progimnazjum would be moved out to the other side of the river (since it’s so close, as Benkunskas argues, moreover the old Wiwulski School shares its building with the Lithuanian school as well! ), but which of the Polish politicians in Lithuania would decide for “finishing the Wiwulski School off” with their own hands? But it’s a different matter when the “hostile hand” wants to leave without a Polish school actually the whole left-bank side of Vilnius from Nemenčinė and Naujoji Vilnia to the Mickiewicz Secondary School and Primary School in Liepkalnis. I don’t know whether the reorganisation will do good to the Lelewel School, but for sure the Polish and Lithuanian unity will benefit from it: when Vilnius Poles claimed their rights by the local government building yesterday, , in the fastness of the tower block the Deputy Mayor, supported by the communities of the Lithuanian Progimnazjum in Antakalnis, explained to the journalists whose children suffered when the Polish-Russian school with half empty classrooms didn’t let the overcrowded Lithuanian one develop. So it seems that a quarter of Vilnius will be left without a Polish school and in the city centre there will be two “long gimnazjums” three kilometres from one another: the Catholics (“Syrokomla”) – on the left, the engineers (“Lelewel”) – on the right! But how can we know when sending a child to school what will be good for them after several years of attending it? Actually, we’re not still sure about those “Catholic elements” either; it’s a dispute just like the one with the Constitutional Tribunal in Macierz [the Association of Polish School Teachers in Lithuania; translator’s note]: the local government claims that a (formally) new school cannot be formed without an ecclesiastical partner, and the W. Syrokomla School community along with AWPL activists state that such an obligation almost doesn’t exist anymore and that the metropolitan bishop’s blessing is just welcome. “Syrokomlówka” can function as a secondary school until 1st September 2017. The parliamentary election will be carried out on 9th October 2016. Into whose hands does the time play? In the throes of the fight for the secondary schools and gimnazjums, the not numerous primary schools in Vilnius stayed in the background. A lot of parents still prefer the system they remember from their youth – “from the 1st grade to the Matura exam in one school” – hence there is less regard for the 8- or even 10-grade schools. However, it’s them actually that are very important and are to ensure greater availability to a Polish school, as – obviously – when somebody doesn’t have such “in the backyard” or somewhere by the way to a parent’s work, they often send their children to the nearest school, regardless of its language and learning ambience. Now new prospects are opening up for the School in Liepkalnis – one of the most modern schools in the Second Polish Republic, whose wall, having been decorated with a beautiful huge map of Poland just before the war, was tightly and solidly covered with stone by Lithuanian authorities after 1939. So, due to the lack of students, it’s to be connected with the Russian Senamiesčio School. We don’t know yet which school is going to be moved to the other; however, the Senamiesčio one is located just behind the Gate of Dawn, and half of the building is already occupied by a private school, probably instructing in English but run by Turks (our portal would be already admonished in Germany because of this fact, as nationality can’t be treated as a differentiating category). The Deputy Mayor claims that in the Old Town there’s also a shortage of Lithuanian kindergartens, so probably it’ll be Russians who will migrate uphill, to Liepkalnis… There, in a Polish school actually, there are still some Russian classes, but after the two have united, Poles will be a minority there presumably. Who bothers? Afterwards it’ll be possible to blab even louder that Poles in Lithuania are Russophiles and Kremlin agents, all you need to do is to slightly push the Slavs towards each other… There’s no longer a threat of Polonisation – Warsaw has been once turned from east to west already and that’s how it’s stayed. A nicely located school in Pavilnys is also a titbit – tradition of a hundred years constitutes an unassailable argument, so any reorganisation isn’t intended there. A nearby Lithuanian school “Vilnies” bursts at the seams as well, while the Polish-Russian one becomes more and more deserted. It’s necessary then to take care of the children providently, and because the Lithuanian school’s extension will probably take some time due to the lack of the needed money – couldn’t neighbours take for instance the little kids under their roof? Such a temporary solution. Tested: “Lelewel” once has also “temporarily” let into the newly renovated school the younger class grades of the Lithuanian Progimnazjum in Antakalnis – accepted until maybe one day Poles – as it was at the end of the 80s – will start to storm schools with the native language of instruction, being able to afford living in Antakalnis. The decrease in the number of students in Polish schools is a compelling argument, even though for years the Polish “Macierz Szkolna” [trans. Educatioonal Society] has announced yearly that a thousand first-graders are going to Polish schools and that there’s no drop. Is it the Vilnians who send their children to the Polish schools of the Vilnius region, or maybe we make up for the fall noticeable in Vilnius in the Šalčininkai region? Where do then all those Polish-sounding names and surnames in Lithuanian and even Russian schools come from? Is it in search for “better quality of teaching”? Apropos the support on the part of Poland: the Vilnius authorities are still open to collaboration with the Association “Polish Community” within the co-financing of Polish schools’ modernisation and renovation! Admittedly, they don’t have money for it this year, as everything has been gobbled up by European projects, but if in the new financial prospect there aren’t so many EU funds – welcome! Pecunia (Latin: money) for the good of children – whether they are from Brussels, Warsaw, or even Moscow – non olet (does not smell)!